At Sprout Insights we provide resources and articles to keep you informed about ways to effectively build your social media presence. 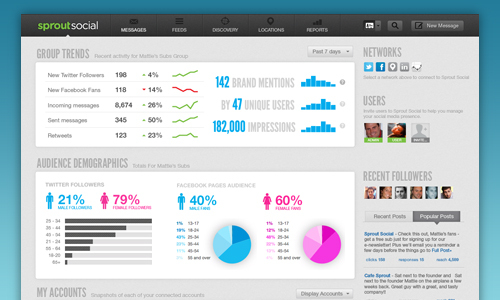 But beyond this publication, our parent company Sprout Social has tools that help you track and control that presence. Sprout Social is a comprehensive social media management tool designed to make the process of brand monitoring and engagement simple and effective. Here are just some of the features that make Sprout Social an all-in-one solution to the fit the growing list of needs of a social media manager. 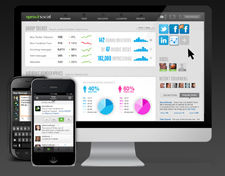 Sprout Social’s dashboard presents you with an organized view of your social networks and up-to-date information about your followers, demographics, and more. From the moment you log in, you’ll be presented with timely information to help you recognize trends and see how your accounts are doing. You’ll be able to access the demographics of your networks, recent followers, popular posts, and follower counts, and remain informed on all the important details of your brand. Social media management is a 24/7 job but Sprout Social makes it easy to keep your accounts active at all hours of the day and night without requiring you to be. 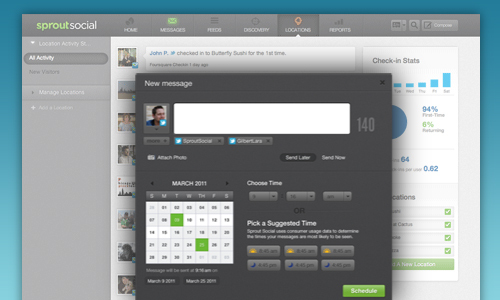 If you have a lot of content to share, our post scheduling feature can help you spread it out throughout the day. Taking it one step further, Sprout Social will even suggest good times to post based on user usage data to make sure your customers see your message. Sprout Social makes it easy to not only publish content but learn from it. Create detailed Twitter and Facebook reports to analyze your performance on your networks, get detailed information on your followers, and see how you’re doing at influencing your customers and engaging with them. View these reports right on the web or publish them as a PDF or Excel spreadsheet. You can also integrate data from Google Analytics into your reporting to see how your social presence is affecting your website. Reports also make it easy to keep those outside of your team updated. With tools to customize branding, you can create professional reports with just a few clicks. Recently, Sprout Social announced integration with your organization’s Zendesk help desk system to provide seamless customer service right from within our website. You can easily transform any social media message into a ticket, get responses from the help desk, and relay this information directly to your customers. Successful social media management is a team effort. 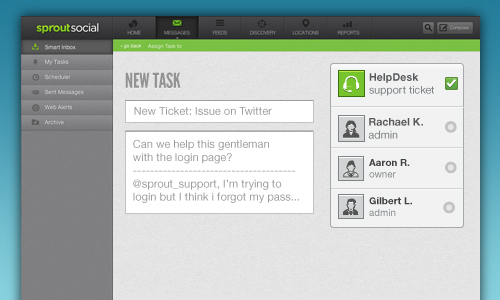 With Sprout Social, you can add multiple users and assign tasks to prevent duplication of efforts. Add notes, see what has already been done, and improve your workflow with tools designed specifically for teams. 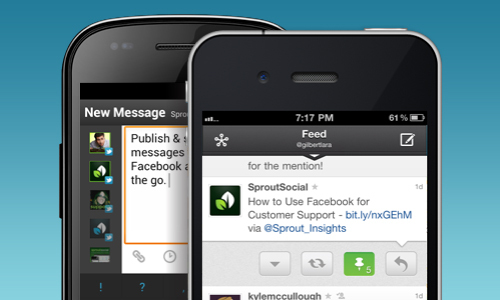 Available for iPhone and Android, the entire Sprout Social experience is mobile-ready. Everything from scheduling messages to monitoring brand mentions, task management, team tools, and contacts management are available while you’re away from your desk. Shareable content can come at any point during the day or night and with the mobile application — you can even view your RSS feeds. 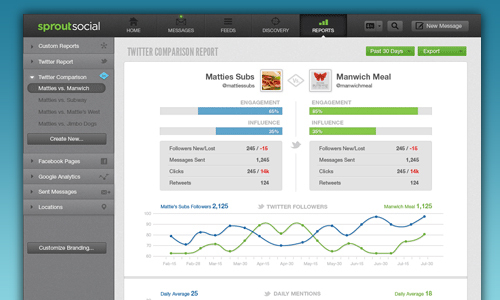 With Sprout Social, it’s easy to get more followers that are relevant to your brand. Powerful search tools allow you to find new customers based on keywords and location. You can then easily add your findings to your lists. You can also clean up your existing followers and remove accounts that are no longer relevant. With RSS and Atom support built right in, it’s easy to find new blog content or promote articles featured on your brand’s website. You can automate the process and have new posts shared from your accounts as soon as they are published. No matter where you are on the web, Sprout Social is right there with you thanks to our bookmarklet. From any page you visit, you can quickly post to any of the accounts that you are responsible for with the same easy to use experience you’re used to from our website. If these features sound helpful to you, sign up for Sprout Social’s free trial and give them all a spin. Let us know what you think and feel free to ask questions in the comments!